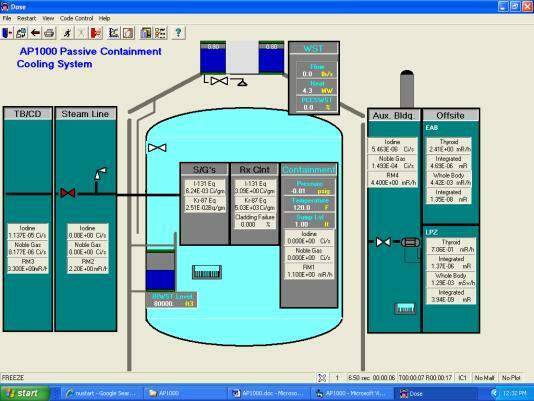 Abstract – The PC-based reactor simulation software PCTRAN was expanded to cover light water advanced nuclear power plants. The plant models include Generation III+ advanced PWR and BWR. The evolutionary ones are Areva, Mitsubishi and Korean Advanced PWR’s and GE ABWR. Adding cooling path redundancy and devises for severe accident mitigation has enhances reliability. One-step further is the passive-cooled Westinghouse AP1000 and GE ESBWR. PCTRAN’s ESBWR and AP1000 models are introduced in this paper. The PC-based simulator will help training and evaluation on the advanced technology for countries and utility companies entering into the second coming of nuclear era. 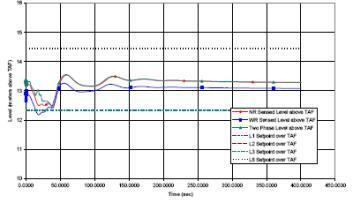 PCTRAN is a code using reduced thermal hydraulic nodes for transient prediction. A moving boundary condition between the saturated two-phase and subcooled regions allows the number of nodes significantly reduced to simplify numerical solution. Since its first introduction1 in 1985, it has evolved from DOS to Windows-XP environment. Operation is in standard graphical-user-interface (GUI) for friendly interactive control. For AREVA EPR, there are four trains of the independent emergency core cooling system and double containment. The large components such as the pressure vessel and its internals, the steam generators and the primary coolant pumps assure modest response during disturbance from normal operation. Should they still fail and a core-melt takes place, the molten core material would be collected and cooled in the cavity area. PCTRAN’s six-node core model for severe accident has successfully reproduced this scenario. Westinghouse AP1000 uses passive heat sink and natural forces to remove decay heat. There are inside-containment refueling water storage tank, accumulators, coolant makeup tanks, passive residue heat removal system and automated depressurization system. For any disturbance it relies on natural course to depressurize the primary coolant and let coolant cover the core effortlessly. The containment is cooled from outside its steel liner by water draining from a tank above the roof. Air draft from the ambient further assists this process. PCTRAN AP1000 rigorously demonstrates all these in vivid animation. It is of high fidelity as the simulated results have been benchmarked against the approved Final Safety Evaluation Report. 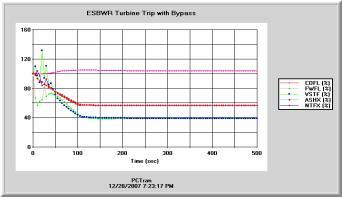 The General Electric ESBWR relies on the use of natural circulation and passive safety features to enhance the plant performance and simplify the design. It was based on the earlier Simplified BWR (SBWR) by economics of scale to a higher power level of 4500 MWt (1560 Mwe). The use of recirculation pumps in previous BWR models or reactor internal pumps for ABWR is completely eliminated. Core flow is by natural circulation. Natural circulation is further used for emergency core cooling and containment cooling. In the event of steam line leak or break, the reactor is shutdown by inserting all control rods from the bottom. The feedwater continues to maintain the water level in the vessel. In the US most utilities planning for advanced reactors have already selected their plant types. The new plant type is significantly different from its current staff’s experience. Despite a replica simulator is in order, when completed it could only suffice control room operator’s training. For vast technical and managerial personnel, PCTRAN could be used for general training to familiarize them with the advanced system’s dynamic performance. It supplements vendor’s supplied text and drawings. In the international market, a number of countries are adopting nuclear power for the first time. Other than relative economical terms, PCTRAN could be used for technical evaluation between plant designs. It is also a training tool for first generation personnel to show basic concepts such as criticality, control systems, emergency cooling and accident mitigation. In this paper two of the above advanced plant types – ESBWR and AP1000 - were selected for simulator presentation. Their designs of user-graphic-interface (GUI) and verification analyses against published safety evaluation reports are described. 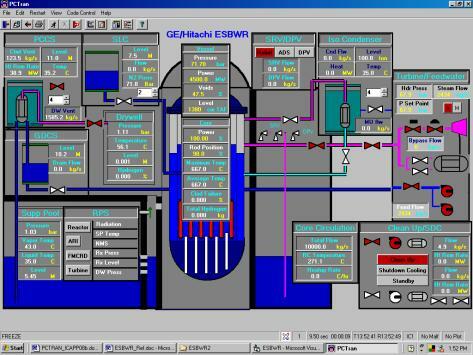 GE/Hitachi’s ESBWR Design Document2 was used to model PCTRAN/ESBWR main mimic. The nuclear steam supply system (NSSS) is designed in a mimic as shown in Fig. 1a. The use of recirculation pumps in previous BWR models or reactor internal pumps for ABWR is completely eliminated. Core flow is by natural circulation. The core flow/power map is a single curve (Fig. 1b). Natural circulation is further used for emergency core cooling and containment cooling. In the event of steam line leak or break, the reactor is shutdown by inserting all control rods from the bottom. The feedwater continues to maintain the water level in the vessel. In the event of AC power is lost, the ESBWR utilizes the Isolation Condenser System for high-pressure inventory control and decay heat removal. In PCTRAN/ESBWR main mimic it is located in the upper right of the reactor vessel. The isolation condenser system has four independent loops. By clicking the scroll bar users can activate one to four trains. The steam is driven by natural circulation upward to the condenser tubes; where it is condensed by the pool water and drain back into the vessel. If the water level continues to fall for a larger break, the Automatic Depressurization System (ADS) is activated to allow low-pressure inventory control. It consists of 10 safety relief valves (SRVs) and 8 depressurization valves (DPVs) connected to the steam line. The SRVs discharge steam to the suppression pool and the DPVs discharge to the drywell respectively. A timely sequence of opening of these valves allows the water from the Gravity Driven Cooling System (GDCS) tanks to flow into the vessel by gravity. The Standby Liquid Control system (SLC) is also activated. It uses nitrogen-filled tanks to drive borated water for coolant makeup. Containment cooling is provided by the Passive Containment Cooling System (PCCS) in the mimic’s upper left side. The system contains four loops; each has a heat exchanger open to the containment, a condensate drain line and a vent discharge line submerged in the suppression pool. The PCCS limits containment pressure to 40 psig (about 4 atmosphere). The passive systems have been successfully analyzed to maintain the fuel covered at all time (without heat-up) and the containment stay cooled for three days. PCTRAN/ESBWR has duplicated all these scenarios consistent to GE’s document. Online “Help” is provided that assists comprehensive user’s manual for easy instruction. 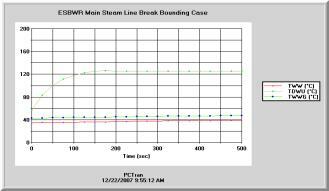 A turbine trip with bypass transient (TTWB) and a main steam line break (MSLB) inside containment bounding case were analyzed using PCTRAN/ESBWR for benchmark against the Design Document2. 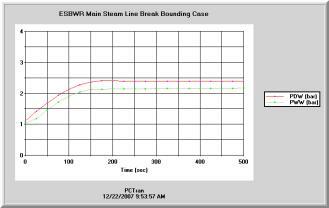 For TTWB, the Alternate Rod Insertion (ARI) is initiated that reduces the reactor power to about 60% with feedwater and steam bypass flow runback to about 40%. Loss of feedwater heating (and thus a greater enthalpy difference to that of steam) is the cause for more reduction in feed and steam flows than the power. The reactor dome pressure, drywell and suppression pool pressures and temperatures are compared in the following figures. They are generally in good agreement. Next a double-ended 950 cm2 steam line break is initiated inside the dry well. The reactor is depressurized while blowdown of the steam inters the suppression pool. Heat-up in the drywell air then enters into the PCCS pool by natural circulation that limits the containment pressure to about 2.4 atmospheres. The PCTRAN/ESBWR results are in good agreement with the Design Document. Fig. 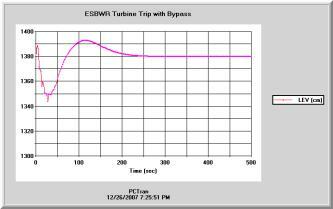 2d ESBWR MSLB DW and WW temperatures: left (GE Document) vs. left (PCTRAN). Westinghouse4 AP1000’s NSSS is similar to conventional PWRs. The reactor primary coolant has two steam generators with four coolant pumps (2x4 configuration). PCTRAN’s mimic (Fig. 3a) right hand side panels are for normal operation control. At left there are panels for the passive emergency core cooling systems (PXS). At top there is the In-Containment Refueling Water Storage Tank (IRWST). The passive residual heat removal (PRHR) heat exchangers are submerged in the IRWST. Three stages of automated depressurization system (ADS) on top of the pressurizer are provided to relieve steam into the IRWST during a small break loss-of-coolant accident. The fourth stage ADS valves are connected to the hot legs and relieve steam directly into the containment atmosphere. Instead of an active high-pressure injection system, that requires safety-graded pumps and emergency AC power supply, the passive systems of coolant makeup tanks (CMT), accumulators (ACC) and IRWST drain valves are modeled. AP1000 has inherently safe characteristics. The reactivity coefficient is negative at all times; that halts the chain reaction in the event of any expected power increase. The core is rated at 3400 MW thermal at full power. The hot and cold leg temperatures are 310ºC (610ºF) and 280.5ºC (537ºF) respectively. These are faithfully reproduced for steady state by PCTRAN in its NSSS mimic. If the reactor makeup system is unavailable, CMT provides passive reactor makeup. The tanks are designed for full RCS pressure and are located above the RCS cold loop piping. It is activated on a low pressurizer water level or low RC pressure safety injection signal. In either case, the reactor is scrammed, the RCP’s are tripped, and the CMT's isolation air-operated valves automatically opened. If a large LOCA occurs, the accumulators are needed to provide a high makeup flow rate. Borate water under nitrogen pressure of 48.3 bars ensures filling of the reactor vessel lower plenum and down comer following a RCS blow down. After the RCS is completely depressurized, IRWST isolation valve is opened to provide water into the RCS by gravity draining. The atmosphere is the ultimate heat sink for the reactor system. For containment cooling, the Reactor Building spray and vent valves are provided. Different from the conventional spray inside the containment, the spray is applied on the outside shell of the steel lining. Film cooling promotes natural air draft from ambient atmosphere to vent through top of the containment. The valve color changes and flow rate digitally displays activation of the passive systems. Operators usually do not have to interfere other than verify and observe its evolution. For a design basis scenario, core decay heat is transferred through the containment vessel to the environment. The containment concrete structure with the baffle provides for natural circulation of outside air. The air enters into the gap between the concrete containment and the baffle at the top, flows down the outside of the baffle, and rises up along the steel containment vessel. The heat transfer is enhanced by a water film formed by the gravity drain of water onto the containment shell from the PCCS water storage tank, that is located at the top of the concrete structure. The tank has sufficient water to provide three days of cooling. The PCCS system is activated in the event of high-pressure reading within the containment. Such an event would take place if the normal heat removal (the containment fan coolers) were unavailable for an extended period of time. The PCTRAN AP1000 PCCS mimic is shown in Fig. 3b. Westinghouse has submitted a Final Safety Evaluation Report (FSER) and USNRC approved it in 2005. For a complete spectrum of loss-of-coolant-accidents (LOCA), the core is never uncovered. PCTRAN has basically reproduced these results with comparable pressure, temperature and water inventory transients. The CMT, accumulator, and ADS systems work well to depressurize the RCS and provide coolant makeup. The PRHR heat exchanger removes the decay heat. The passive containment system supplies coolant from the highly located WST that enhances natural air draft cooling by the atmosphere. These phenomena are quantitatively demonstrated with vivid graphics and animation. It is therefore an indispensable tool to supplement text material for a comprehensive AP1000 training program. 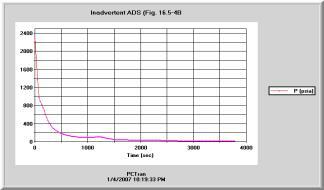 The case of inadvertent ADS initiation by opening one of the first stage valves was analyzed. The reactor is then tripped on low pressure and the “S” signal tripped the reactor and coolant pumps, started the CMT and accumulator injections. Following are pressure comparison. Second and third stage ADS valves opened 70 seconds and 190 seconds respectively after initiation. The fourth-stage ADS opened to the containment at the CMT level down to 20% level. Eventually the RCS is depressurized to allow IRWST water to drain down by gravity to refill the core. The entire transient agrees closely with FSER. A 10-inch (500 cm2) cold leg break is initiated. 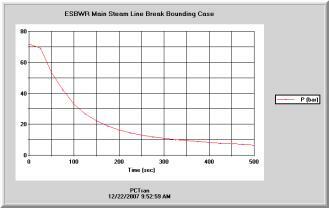 After the reactor trip on low pressure and containment high pressure “S” signal, the coolant pumps trip, steam generator isolation, start of the CMT, PRHR, accumulators and ADS occur subsequently. PCTRAN’s results are shown in the following figures. The break discharge soon turns from liquid to two-phase as the cold leg is exposed. It is witnessed by the break specific enthalpy. Comparison with FSER Case 15.5.5.4B- shows basic agreement. There is no core exposure and heatup. A 3000-cm2 hot leg break is initiated without any operator actions. 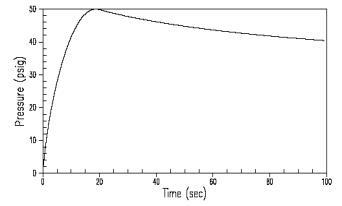 The reactor building pressure calculated by PCTRAN and FSER are compared in Fig. 3f. heading to the second coming of the nuclear era. L. C. PO, “Analysis of the Rancho Seco Overcooling Event Using PCTRAN,” Nuclear Science & Engineering, 98, 154-161 (1988). GE/Hitachi Design Control Document Tier 2 26A6642AT, Chapter 6 ECCS and BP Chapter 15 Safety Analysis, Rev. 4 (2007). 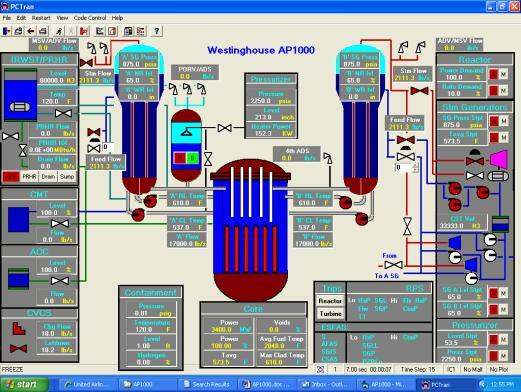 Westinghouse Electric Company, “AP1000 Design Control Document”, APP-GW-FL700 (2004).